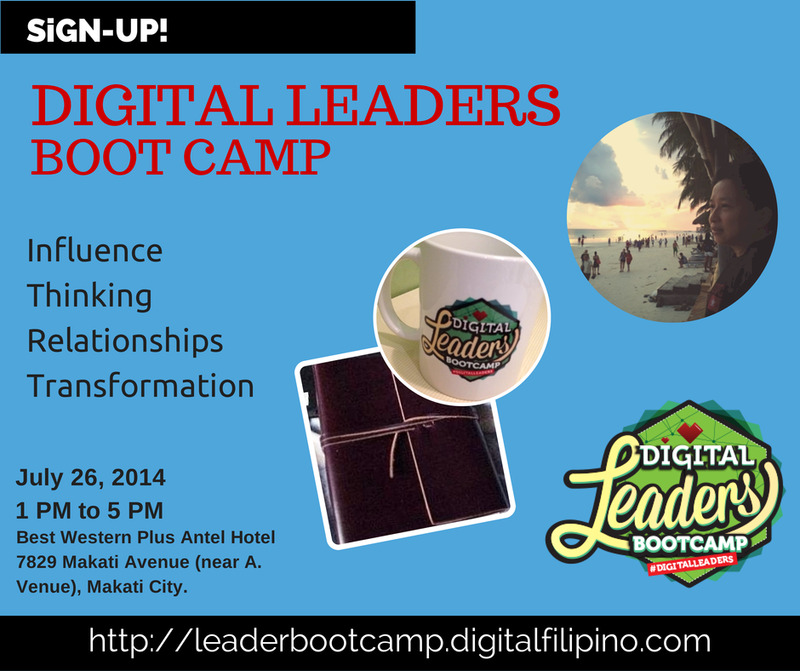 Join the Digital Leaders Boot Camp – a leadership workshop online (#digitalleaders) to be conducted by E-commerce expert Janette Toral happening on July 26, 2014. It is a great venue for insights and lessons learned sharing designed for the aspiring start-up entrepreneur or marketer with minimal resources and plenty of challenges including dealing with people (politics, relationships, misunderstandings). The first face-to-face session will take place at Best Western – Antel Hotel, A. Venue, Makati Avenue, Makati City from 1 pm to 5 pm. It can be taken by anyone interested whether students, professionals, employed individuals, marketers, and entrepreneurs. The fee for this boot camp is one thousand pesos (P1,000) inclusive of light snacks. You can check out the program description. If you don’t have a user account yet, create one. A verification e-mail will be sent to you. Check your spam or bulk folder if it can’t be found in your inbox. Log-on to your account and return to this page. Click on the “TAKE THIS COURSE” button at the lower portion of this announcement. Choose your payment option (cash, credit card, Paypal). Once payment is processed, email the Paypal receipt or bank deposit slip to Janette Toral at janette(at)digitalfilipino(dot)com or send it via private message at our Facebook page. For bank payment, please deposit to: iMarket Events and Services, Inc. at BDO 209-0233-385. Official receipt shall be given to you at the event. If materials are uploaded already, you will see the list of lessons posted below. Just click on them to access.